NBCBLK, the African-American news vertical of NBCNews.com, is presenting its inaugural “She Thrives: Black Women Making History Today” series — a month-long special feature recognizing the accomplishments, power and prowess of black women and their leadership across various communities and industries. The series honors ten women whose accomplishments align closely with the NBCBLK mission — to elevate America’s conversation about black identity, social issues and culture. This year’s honorees include Lisa Borders (president and CEO, Time’s Up), Nafessa Williams (actress), Jasmine Crowe (founder, Goodr), Ketanji Brown Jackson (US district judge, D.C.), Millie Brown (founder, Tears of a Mother’s Cry) and more. Readers can see the full list on NBCBLK’s site. The “She Thrives” selection committee is made up of NBC News and MSNBC editorial and business leadership, which includes NBC News and MSNBC’s Miley, “Today” anchor Sheinelle Jones, NBC News and MSNBC’s Morgan Radford, NBCBLK’s Janell Ross and more. 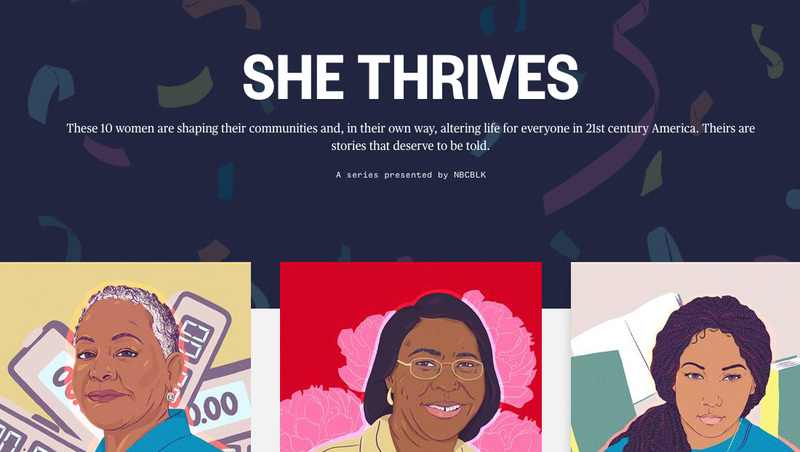 In total, the committee received more than 250 submissions to the “She Thrives” nomination platform.